The absence of a backyard does not need to mean the end for effective waste reduction strategies in your home. Sure, the abundance of exterior turf, soil and garden space sure does make the job easier. The proximity of your neighbours in unit living is another factor to consider, as is the space you have for your plants and the volume of waste to usage ratio. But with a little imagination and the help from some innovative waste reduction products on the market, unit living need not be a hindrance to your environmental efforts. The implementation of your chosen waste reduction and composting option will mean effective use of your waste, happier plants and a happier and healthier environment. So we have chosen two simple and effective options for unit dwelling waste reduction. Thanks to some clever companies, composting when living in an apartment is very much achievable. The Bokashi One is a compact, eco-friendly composting system designed for use within your kitchen. The combination of the 410mm high, 310mm wide and 300mm deep bucket with the Bokashi One mix, can hold approximately 19 litres of food waste. The airtight lid and small size means you can store the Bokashi One conveniently in your kitchen with minimal odour issues. Once broken down, the nutrient-rich compost and juice can be extracted for use on your balcony garden and plants. For those with excess compost and liquid, the small and portable nature of the Bokashi means you can travel with the system to a nearby friend of family garden and share the love. Their garden will thank you for it! The beauty about worms is that they will thrive anywhere! It doesn’t matter if you live in a house, duplex, high-rise or country farm. With the right environment and conditions, you can keep any worm happy. There is an abundance of information available on how to start a worm farm. As well as many stores (aka – Bunnings) where you can buy a starter worm farm kit. Check out the Australian Government Energy Savings page on building your first worm farm and things to consider. See which waste reduction option is best for you. 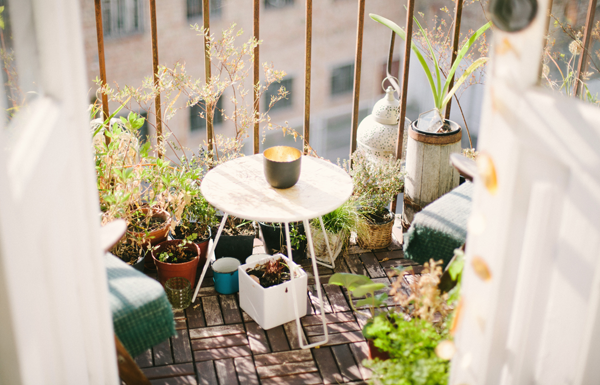 Before you know it, your balcony will be the talk of the town.